We can no longer walk between dinosaurs, but between majestic and herculean specimens of the species Sequoiadendron giganteum. 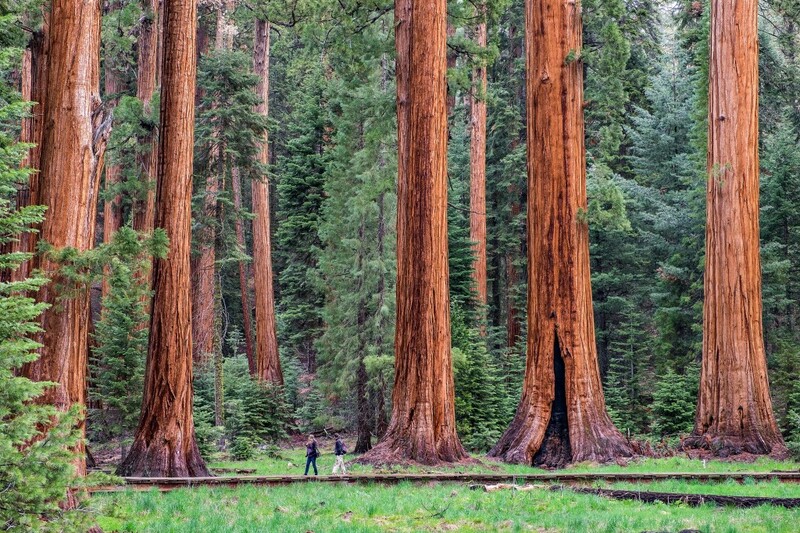 Stop imagining and give yourself the whim of approaching the Sequoia National Park, where the descendants of giants millions of years ago are still among us. The most powerful example of these conifers in the park is the General Sherman: Its 85 m of height, 11 m of diameter, 30 m of perimeter and about 1,500 m3 of volume, make it the living thing with more biomass of the planet. It weighs about 2,000 tons and was born 2,000 years ago. The longest still alive, however, is The President, with 3.200 years of age. Located south of Sierra Nevada (California, USA), the reserve was created in 1890 and has a length of 1,635 km2, being especially known for its splendid redwood forest. In addition, in the park we will also find Mount Whitney (4,418 m, the largest US summit outside Alaska), the Kern River Canyon and Crystal Cave, a gleaming cavern of marble, stalactites and stalagmites. Feeling the mystical and grandiose experience of wandering among titans of other times is a gift. It is a privilege to be able to live one of the greatest and most breathtaking spectacles of nature.